Now, I’m going to be honest here, the way this thing is pitched (“Sense-Roid provides you a passionate tactile communication with ‘YOURSELF'”) isn’t really the right way to go about it. People don’t hug themselves, not because they can’t (you can, kind of), but because it isn’t emotionally fulfilling. Hugging someone else is… well, I don’t need to explain why hugs are nice. At least not to you guys, but maybe I should send an email to the Sense-Roid inventors. The technical achievement is interesting, but I’m guessing this is something the teledildonics community (yes) has already investigated pretty thoroughly (the creators of the Sense-Roid have also put out kiss and tickle transmission devices). 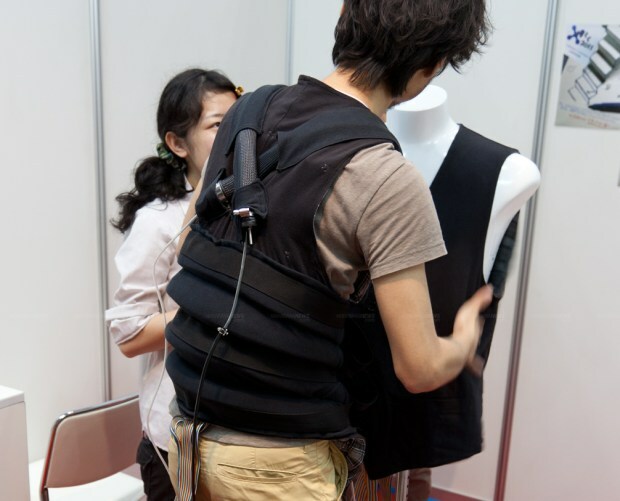 On the other hand, a vest like this connected with one some distance away could actually be very therapeutic to someone who is stuck in a hospital or away for work. I’m being serious, here. People in hospitals and jail and such get emotionally isolated, and part of that is the lack of contact with their loved ones. I get the feeling that a remotely operated hug-jacket like this could actually be really beneficial in therapy. But as you probably noted in the video, that possibility is largely unexplored in favor of self-love. I… don’t know what else I can say. More information at Kajimoto Laboratory.